Over the past five or six years, I’ve gotten into cycling–not just dabbling, but full-on cycling. Six years ago, I had one hardly ever used hybrid bike in the basement. Now I have four bikes. I ride a lot–nearly 100 miles a week in the summer. No doubt about it–I’m addicted to cycling!! And when I look for the source of this addiction, I point at my friend, Seth. Seth renewed my childhood passion for cycling while he trained me for a six-day ride from Washington, DC to Pittsburgh, PA a few years ago. Long trip, but fun ride and I got to know Seth really well. Seth is Vegan. He eats nothing that has eyes or a face, and he’s completely dedicated to that food philosophy. Consistent with his vegan diet, Seth drinks beer. Beer is vegan. Mind you, not just any beer–it has to be locally-brewed craft beer. This is where my friend Tim comes in. Seth introduced me to Tim. Tim is also an avid cyclist, and all three of us frequently cycle together–with me usually riding ‘sweep’ in the rear!! Seth and Tim enjoy craft beer. Check that–they have a passion for craft beer!! I have spent countless hours in the back of a beat up old Ford van searching high and low for the best local brew in some cycling stop-over city. They even make their own home brews, and all their friends make home brews. We even get home brew status reports so we can make plans to celebrate home-brew births together (the day the beer is ready to drink after weeks or months of basement gestation). It was hard to not catch the passion they have for good, locally-brewed craft beers. Prior to hanging out with Seth and Tim, I drank one or two beers a year, if that!! I was, and still am, a gin martini followed by red wine drinker. And I am at most, a moderate drinker. I’m usually the designated driver when I’m out with my buddies. It’s OK–it’s an important role, and someone has to do it. While in the company of Seth and Tim, I learned that no cyclist worth their keep will finish a good, hard bike ride without first putting down some ‘recovery carbs’ by drinking a beer of two. Enjoying beer is a part of the initiation into the biking culture. (Remind me to post something on the well-attended Keg Rides we have every spring and fall in Pittsburgh.) Anyway, they introduced me to many of the Pittsburgh-based craft beer houses, and I began to enjoy tastings with them. Now I’m hooked–not addicted mind you–just hooked on finding that one great locally-brewed craft beer after a ride, or sharing a growler with a bunch of guys after a great ride. And in this process of tasting, I have discovered I really like fresh-tasting, medium-body, hoppy beers–IPA’s, Belgium Whites and some wheat-style beers. I don’t like malty, toasty, dark or heavy beers, nor do I care for fruity beers. Another one of Seth and Tim’s beliefs is that beer carbs go really, really well with food carbs. Remember, Seth is a vegan, and Tim is a sometimes vegan when he is with Seth. So, by default that makes Lou a sometimes vegan when he is hanging with Seth and Tim. I know, it’s complicated. In any event, when Seth and Tim finish a ride at Lou’s house, I have to prepare vegan carbs for us to enjoy with our craft beers. One of my absolute favorite source of good carbs, and now Seth and Tim’s favorites, is Lou’s ‘homemade’ guacamole. 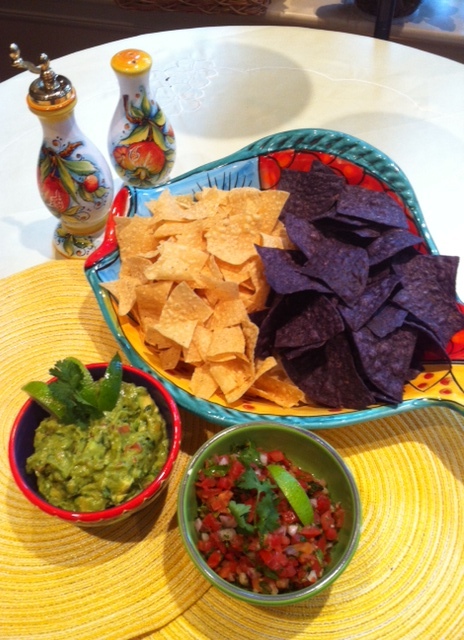 The recipe is simple, fast and tastes incredibly good with store bought lime-infused tortilla chips. As you will see, I also serve the “left-over” salsa along side the guac for a nice snack combo. Last weekend I prepared it for my wife, daughter and a woman friend of the family for our mothers day cocktail hour. Guess what?! It got great praise from all three of them. So, my take is that when I’m preparing food for the guys but the woman in my life think it’s not guy food, then we have something to celebrate! I strongly suggest you get some great craft beer, or a nice crisp California Sauvignon Blanc and get them iced up, prepare this amazingly easy guacamole, and serve it with the salsa and chips for a pre-dinner cocktail or as a Saturday afternoon snack break. Watch out!! Don’t stand too close because they are going to be gone in a flash of fire. 1. This first step is a proven short cut, which I use in my cooking as often as I can. You should too. Go to one of the better grocery stores in your area (Whole Foods, Trader Joes) where they make a ‘fresh made’ guacamole. Pick up a pint of two. Right next to it, you’ll probably find ‘fresh made’ salsa. Buy the medium hot salsa, because you can always make it hotter later. You’ll find them both in the cold prepared food section of the store. It’s ok if you need to buy the bottled salsa, but don’t be a cheapskate, buy the good stuff. These store-bought guac’s and salsas are usually pretty bland tasting, but a great base to start with. 2. Also buy one or two firm-ripe avocados, some limes and a small bunch or cilantro (it a leafy herb that looks like parsley, but it’s not). You’ll have the rest of the ingredients at home. If you don’t, buy them now, because you should always have these ‘staples’ in your fridge or kitchen. 3. At home, empty the guacamole into a bowl. Cut the avocado(s) in half, remove the seed, and remove the avocado meat from the skin with a big serving spoon. Roughly chop the meat and add it to the bowl. 4. Taste the guac before you add anything. This is a KEY step. If it’s already salty, you’ll want to be careful with salt. If it’s not spicy enough, you’ll want to remember that when adding the Tabasco. 5. Next, add 2 or 3 heaping tablespoons of the salsa to the bowl. More if you want or less if you like. You are in charge here!!! 6. After the next few steps are completed, erase my name and put your name in front of this recipe, because this will be your special guac from now on!! 7. Add to the bowl: the juice of half a fresh lime, a few dashes of Worcestershire Sauce, a few dashes of Tabasco Sauce, some salt (careful!!) and some ground pepper. 8. Mix it up, but not too much. You want to retain the chunky texture of the guac and you don’t want it too watery. 9. That’s it. Once it tastes good to you, it’s good to go!! Chill it for an hour or so in the fridge. Also chill the rest of salsa while you are at it. 10. Don’t serve it in the bowl you made it in. Go the extra mile because you need to feed the eyes too. Get out 2 nice serving bowls–preferably 2 that match or complement one another. It’s all about the details!! Trust me on this. 11. Carefully scoop the guac into the center of one bowl. Slice the other half of the lime into three wedges and arrange them on top of the guacamole. Now put the salsa into the other bowl in the same way. 12. Finally, chop up about 4 or 5 tablespoons of the cilantro. Sprinkle a little on top of the guacamole. Place the rest of it in the salsa bowl and carefully mix it in. It is amazing what this herb will do to kick both the guac and the salsa up a full 2 notches. Get another nice bowl for the store bought tortilla chips. Serve them alongside the quac and salsa, and uncork the wine or pop the craft beer you bought. Categories: Great Recipes, Just Great Ideas!, Loving Life!